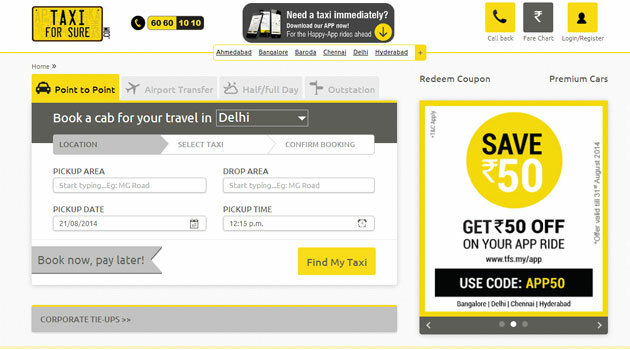 Bangalore-based Serendipity Infolabs Pvt Ltd, the company behind the online taxi booking platform TaxiForSure.com, has raised an undisclosed amount in its Series C round of funding led by Accel Partners (US), with participation from existing investors, including Bessemer Venture Partners and Accel Partners (India). While the funding amount has not been disclosed, a Times of India report pegs the deal size at $30 million. The latest round comes barely three months after the firm bagged $10 million in Series B funding led by Bessemer. "We cannot disclose the size of the latest investment. The fund will be used to grow in the existing cities and also to expand to 30 more new cities in one year," Aprameya Radhakrishna, co-founder of TaxiForSure, told Techcircle.in. The firm, which is currently operating in Bangalore, Chennai, Delhi, Hyderabad, Ahmedabad and Baroda, is looking to expand operations to more cities, including Mumbai, Pune, Kolkata, Jaipur, Chandigarh, Surat, Indore and Bhopal by the end of 2014. The company was founded in June 2011 by Raghunandan G and Aprameya Radhakrishna, both engineering graduates from NITK Surathkal who got their management degrees from IIM Ahmedabad. Prior to starting TaxiForSure, Radhakrishna had worked as head of business development for PDS at Jones Lang LaSalle (India). He had also worked with Infosys. Raghunandan had earlier worked with Feedback Ventures as a consultant. The startup acts as an aggregator of car/cab rentals and its offerings include local point-to-point pick-up and drop, airport transfer, local packages (for four or eight hours) and outstation packages. Besides regular rentals, it provides luxury cars like Rolls Royce Phantom, Hummer, Limousine, Jaguar, Audi A6, BMW 7 Series and Mercedes S class. TaxiForSure claims that it has seen 700 per cent growth since August 2013, and surpassed more than 2 million transactions to date. It is currently working with more than 5,000 drivers and more than 400 operators. The firm is also expanding its teams across operations, marketing, analytics, HR, product and engineering. Last July, TaxiForSure had raised an undisclosed amount in Series A funding from Accel Partners, Helion Venture Partners and Blume Ventures. Mumbai-based Avendus Capital advised TaxiForSure on the latest transaction. Online taxi booking is one of the fastest growing segments in India, and a number of domestic as well as global VC investors and PE firms have already poured millions of dollars into this space. Leading domestic players include Olacabs, Savaari, taxiGUIDE and Cabs24X7. TaxiForSure is mainly competing with Olacabs, which recently raised Rs 250 crore ($41.8 million) in its Series C round of funding led by Hong Kong-based Steadview Capital and Sequoia Capital. Last October, Google Venture-backed mobile-based on-demand car hire service Uber came to India, which has already expanded to all major cities, including Mumbai, Bangalore, Hyderabad and Chennai. The firm recently closed $1.2 billion in fresh funding from institutional investors, mutual funds, PEs and VC investors at $17 billion pre-money valuation. Last year, ZoomCar, a membership-based self-drive car rental service launched by two US citizens, entered India and raised $1.6 million in funding from a group of domestic as well as foreign investors.